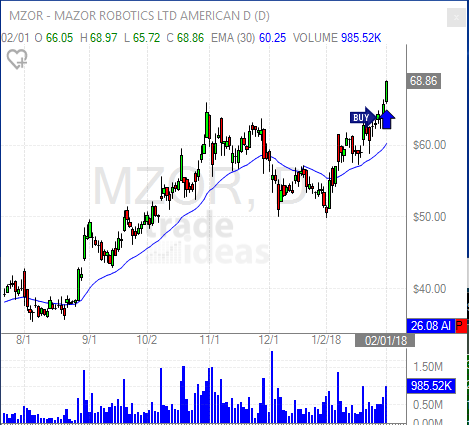 You wouldn’t know by looking at a chart of $MZOR the past few days that the broader market indices had suffered their first noticeable pullback of 2018 (does a 2% pullback in the S&P 500 off all-time highs even matter?). Maybe HOLLY has a soft spot in her heart for a company operating in the robotics space? Regardless, since capturing HOLLY’s attention on Monday, the stock has already moved 8% higher and shows signs that another major move may be just getting started. And with earnings coming up on February 15, there may be some more upside surprises in store. We’ll be adding MZOR to the HOLLY Hot List model portfolio at tomorrow’s opening print. And we’ll continue to keep this stock in the portfolio until such time as we see experience a 20% pullback from the high print we set while holding this position. Since this list is relatively new and we’ve been in a strong bull market since inception, we haven’t seen any exits from this list yet. We’ve basically just been in additions mode. For now. Since our last report, we’ve been able to move the stop higher for $NYT as it continues to show strength as one of our top performers.